It was without a doubt THE best heavyweight fight of last year. 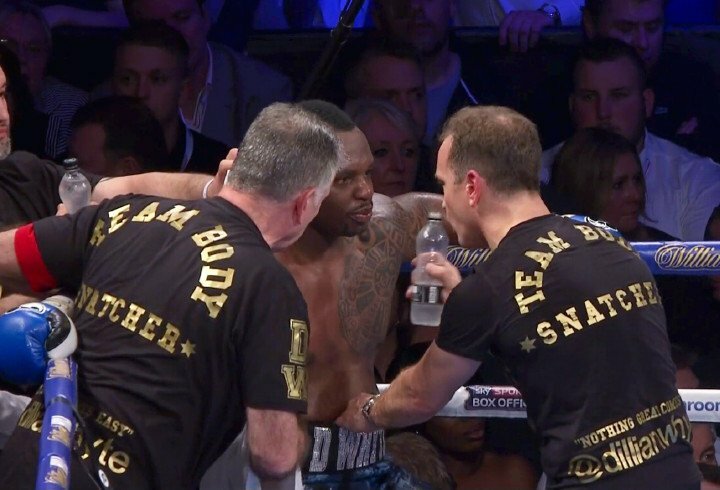 It was the 12 round war rival British heavies Dillian Whyte and Dereck Chisora engaged in in December, and almost as soon as the oh, so close points victory was awarded to Whyte, fans began asking for a part two. In fact, according to Chisora – who believes he should have had his hand raised after the 36 minutes of electrifying warfare was over, not Whyte – people are going up to Whyte on an almost permanent basis, telling him he lost and that he should fight the return fight. Chisora, in speaking with Sky Sports, said Whyte can forget about fighting anyone else next other than him. Chisora is reportedly hopeful of getting the return fight in May, but Whyte has repeatedly said it has to make “rankings sense” if he’s to rumble with “Del Boy” again. Of course the fans want to see it and it really would be a shame if such a great fight – arguably one of the best British heavyweight fights in many years – did not happen again. It was great, it was close – it deserves a rematch. And both men have vowed, even promised, to KO the other guy this time around. Only Chisora could come up with a statement like that! In truth, both men took their lumps and must have been buzzed at least a few times during the intoxicating battle. How much did the war take out of both men? If Chisora gets what he wants, we will find out soon enough. And though it’s unlikely the rematch would be as great as the first fight (but at the same time you never know!) another excellent fight looks a good bet.